The batteries on the probes, which had been charged prior to launch almost a year earlier, might not have retained sufficient power. 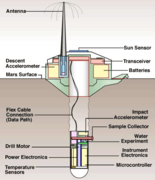 ^ "Report on the Loss of the Mars Polar Lander and Deep Space 2 Missions" (PDF). Jet Propulsion Laboratory. 22 March 2000. ^ Young, Thomas (March 14, 2000). 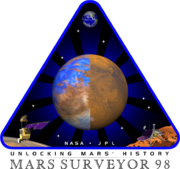 "Mars Program Independent Assessment Team Summary Report". Draft #7 3/13/00. House Science and Technology Committee. Retrieved April 22, 2009. Delta II is an American expendable launch system, originally designed and built by McDonnell Douglas. Delta II is part of the Delta rocket family and entered service in 1989, Delta II vehicles included the Delta 6000, and two Delta 7000 variants. 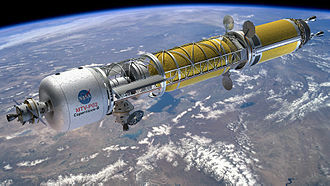 In the early 1980s, all United States expendable launch vehicles were planned to be phased out in favor of the Space Shuttle, production of Delta, Atlas-Centaur, and Titan 34D had ended. McDonnell Douglas, at time the manufacturer of the Delta family. 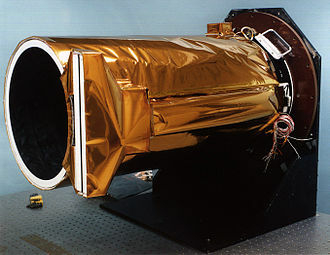 These were intended to launch a series of GPS Block II satellites, the Air Force exercised additional contract options in 1988, expanding this order to 20 vehicles, and NASA purchased its first Delta IIs in 1990 for the launch of three Earth-observing satellites. The first Delta II launch occurred in 1989, with a Delta 6925 boosting the first GPS Block II satellite into a 20,000 km high orbit, the first Delta II 7000-series flew in 1990, replacing the RS-27 engine of the 6000-series with the more powerful RS-27A. 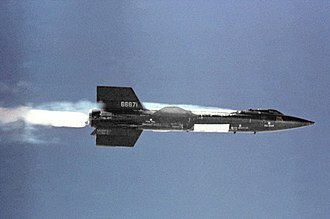 Additionally, the steel-cased Castor 4A solid boosters of the 6000 series were replaced with the composite-cased GEM40, all further Delta II launches except three were of this upgraded configuration, and the 6000-series was retired in 1992. McDonnell Douglas began Delta III development in the mid-90s as increasing satellite mass required more powerful launch vehicles, the upgraded boosters would still find use on the Delta II, leading to the Delta II Heavy. In total, the Delta II family has launched 153 times, no one was injured, and the launch pad itself was not seriously impacted, though several cars were destroyed and a few buildings were damaged. In 2007, Delta II completed its 75th consecutive successful launch, with the launch of SMAP in 2015, the Delta II has enjoyed 98 consecutive successful launches, with two more scheduled in 2017 and 2018. Should these launches be successful, the Delta II would achieve an unprecedented 100 consecutive launch successes, the first stage of the Delta II is propelled by a Rocketdyne RS-27 main engine burning RP-1 and liquid oxygen. Roald Engelbregt Gravning Amundsen was a Norwegian explorer of polar regions. He led the Antarctic expedition of 1910–12 which was the first to reach the South Pole, in 1926, he was the first expedition leader for the air expedition to the North Pole. 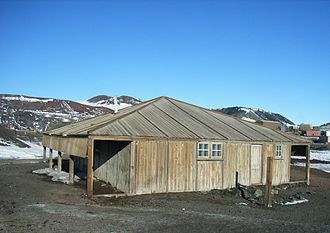 Amundsen is recognized as the first person, without dispute, as having reached both poles and he is known as having the first expedition to traverse the Northwest Passage in the Arctic. In June 1928, while taking part in a mission for the airship Italia. Amundsen was a key leader during the Heroic Age of Antarctic Exploration, in the class of Douglas Mawson, Robert Falcon Scott. Amundsen was born to a family of Norwegian shipowners and captains in Borge and his parents were Jens Amundsen and Hanna Sahlqvist. Roald was the son in the family. His mother wanted him to avoid the family trade and encouraged him to become a doctor. He promptly quit university for a life at sea, Amundsen had hidden a lifelong desire inspired by Fridtjof Nansens crossing of Greenland in 1888 and Franklins lost expedition. He decided on a life of exploration of wilderness places. Amundsen joined the Belgian Antarctic Expedition as first mate and this expedition, led by Adrien de Gerlache using the ship the RV Belgica, became the first expedition to winter in Antarctica. The Belgica, whether by mistake or design, became locked in the sea ice at 70°30′S off Alexander Island, the crew endured a winter for which they were poorly prepared. By Amundsens own estimation, the doctor for the expedition, the American Frederick Cook, probably saved the crew from scurvy by hunting for animals and feeding the crew fresh meat. In cases where citrus fruits are lacking, fresh meat from animals that make their own vitamin C contains enough of the vitamin to prevent scurvy and this was an important lesson for Amundsens future expeditions. 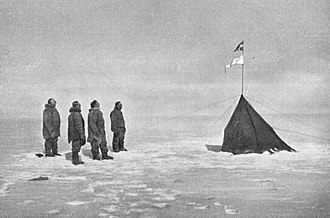 In 1903, Amundsen led the first expedition to successfully traverse Canadas Northwest Passage between the Atlantic and Pacific oceans and he planned a small expedition of six men in a 45-ton fishing vessel, Gjøa, in order to have flexibility. Alba Mons is an immense, low-lying volcano located in the northern Tharsis region of the planet Mars. It is the largest volcano on Mars in terms of area, although the volcano has a span comparable to that of the United States, it reaches an elevation of only 6.8 km at its highest point. This is about one-third the height of Olympus Mons, the tallest volcano on the planet, the flanks of Alba Mons have very gentle slopes. The average slope along the northern flank is 0. 5°. In broad profile, Alba Mons resembles a vast but barely raised welt on the planets surface and it is a unique volcanic structure with no counterpart on Earth or elsewhere on Mars. In addition to its size and low relief, Alba Mons has a number of other distinguishing features. The central portion of the volcano is surrounded by a ring of faults and fractures, called Alba Fossae on the volcanos western flank. The volcano has long, well preserved lava flows that form a radiating pattern from the volcanos central region. The enormous lengths of individual flows implies that the lavas were very fluid. Many of the flows have distinctive morphologies, consisting of long, the low areas between the ridges show a branching pattern of shallow gullies and channels that likely formed by water runoff. Alba Mons has some of the oldest, extensively exposed volcanic deposits in the Tharsis region, geologic evidence indicates that significant volcanic activity ended much earlier at Alba Mons than at Olympus Mons and the Tharsis Montes volcanoes. Volcanic deposits from Alba Mons range in age from Hesperian to early Amazonian, for years the volcanos formal name was Alba Patera. Patera is Latin for a drinking bowl or saucer. The term was applied to certain ill-defined, scalloped-edged craters that appeared in early spacecraft images to be volcanic in origin, in September 2007, the International Astronomical Union renamed the volcano Alba Mons, reserving the term Alba Patera for the volcanos two central depressions. Nevertheless, the volcano is still commonly called Alba Patera in the planetary science literature. It is the third biggest obvious impact structure on the planet after the Hellas and Argyre basins – it is about 1,500 km in diameter. Isidis was likely the last major basin to be formed on Mars, due to dust coverage, it typically appears bright in telescopic views, and was mapped as a classical albedo feature, Isidis Regio, visible by telescope in the pre-spacecraft era. A study reported in Icarus, described the complex history of parts of Isidis. This contact is the edge of a vast Martian ocean. The researchers found evidence of a Late Hesperian/Early Amazonian Sea in the area, the sea would have quickly froze over. Just to the west of Isidis is Syrtis Major Planum, a shield volcano that is a prominent dark albedo feature of Mars. Around the Isidis basin magnesium carbonate was found by MRO and this mineral indicates that water was present and that it was not acidic, pH conditions more favorable for the evolution of life. The name Isidis Planitia follows the earlier name Isidis Regio, isis is the Egyptian goddess of heaven and fertility. An aeroshell is a rigid heat-shielded shell that helps decelerate and protects a spacecraft vehicle from pressure and possible debris created by drag during atmospheric entry. Its main components consist of a shield and a back shell. The heat shield absorbs heat caused by air compression in front of the spacecraft during its atmospheric entry and its purpose is used during the EDL process of a spacecrafts mission, or the Entry and Landing process. First, the aeroshell decelerates the spacecraft as it penetrates the planet’s atmosphere, the heat shield absorbs the resulting friction. During descent, the parachute is deployed and the shield is detached. 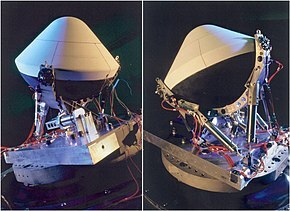 Rockets located at the shell are initiated to assist in the decrease of the spacecrafts descent. Airbags are inflated to cushion the impact, the spacecraft bounces on the planet’s surface directly after the first impact. The spacecrafts lander petals are deployed after the airbags are deflated and retracted, communication throughout this entire process is relayed back and forth from mission control and the actual spacecraft through low-gain antennas that are attached to the back shell and on itself. A lander is a spacecraft which descends toward and comes to rest on the surface of an astronomical body. For bodies with atmospheres, the landing occurs after atmospheric entry, in these cases, landers may employ parachutes to slow down and to maintain a low terminal velocity. Sometimes small landing rockets are fired just before impact to reduce the impact velocity, landing may be accomplished by controlled descent and setdown on landing gear, with the possible addition of a post-landing attachment mechanism for celestial bodies with low gravity. Some missions used inflatable airbags to cushion the landers impact rather than a traditional landing gear. When a high velocity impact is planned not for just achieving the surface but for study of consequences of impact, the spacecraft is called an impactor. Several terrestrial bodies have been subject of lander and/or impactor exploration, among them Earths Moon, the planets Venus and Mercury, the Saturn moon Titan, the asteroids and comets. 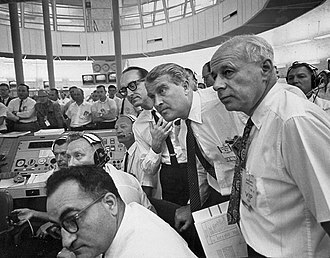 A number of Moon probes, such as members of the Soviet Luna program. 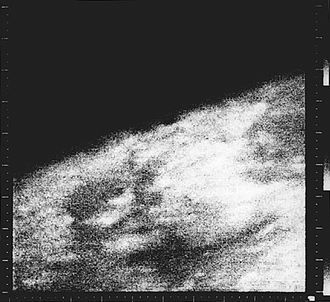 In 1959 the first impact on Moon intended to be by Luna 1 probe but occurred by Luna 2 probe, the Soviet Luna 9 was in 1966 the first spacecraft to achieve a lunar soft landing and to transmit photographic data to Earth. 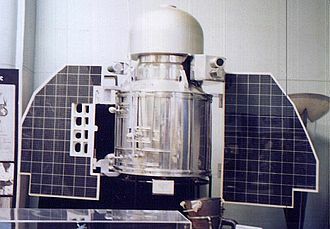 The Altair spacecraft, previously known as the Lunar Surface Access Module or LSAM, was the lander for Project Constellation. As of August 2012 NASA is developing vehicles that use a rocket descent engine permitting them land on the Moon and these vehicles include the Mighty Eagle lander and the Morpheus lander. The Project Morpheus lander may have sufficient thrust to propel a manned ascent stage, a first Boomerang-class lunar sample return mission plans under open source OpenLuna program. Russia has plans for Luna-Grunt mission to return samples from the Moon by 2021, the Chinese Change 3 mission and its Jade Rabbit rover landed on 14 December 2013. Then China plans to repeat lander with rover in Change 4 mission after 2015 that will followed by Change 5 and Change 6 sample return missions in 2017 and before 2020. Valles Marineris is a system of canyons that runs along the Martian surface east of the Tharsis region. At more than 4,000 km long,200 km wide and up to 7 km deep, Valles Marineris is one of the largest canyons of the Solar System, surpassed in length only by the rift valleys of Earth. Valles Marineris is located along the equator of Mars, on the east side of the Tharsis Bulge and it has been recently suggested that Valles Marineris is a large tectonic crack in the Martian crust. Most researchers agree that this formed as the crust thickened in the Tharsis region to the west, near the eastern flanks of the rift, there appear to be channels that may have been formed by water or carbon dioxide. It has proposed that Valles Marineris is a large channel formed by the erosion of lava flowing from the flank of Pavonis Mons. There have been many different theories about the formation of Valles Marineris that have changed over the years, ideas in the 1970s were erosion by water or thermokarst activity, which is the melting of permafrost in glacial climes. Many scientists agree that there was liquid water flowing on the Martian surface in the past, Valles Marineris may have been enlarged by flowing water at this time. Another hypothesis by McCauley in 1972 was that the canyons formed by withdrawal of subsurface magma, around 1989 Tanaka and Golombek proposed a theory of formation by tensional fracturing. The most agreed upon theory today is that Valles Marineris was formed by rift faults like the East African Rift, made bigger by erosion and it has been proposed that Valles Marineris was formed by flowing lava. The formation of Valles Marineris is thought to be tied with the formation of the Tharsis Bulge. The Tharsis Bulge was formed from the Noachian to Late Hesperian period of Mars, stage two consisted of more volcanism and a loss of isostatic equilibrium, the source regions of the volcanism no longer resided underneath Tharsis, creating a very large load. Finally, the crust failed to hold up Tharsis and radial fractures formed, stage three mainly consisted of more volcanism and asteroid impacts. The Apollo 16 Extended Apollo Lunar Module, a lunar lander. The lunar surface through an Apollo Lunar Module window shortly after landing. Surveyor 3 on the Moon. Lithium 9 volt, AA, and AAA sizes. 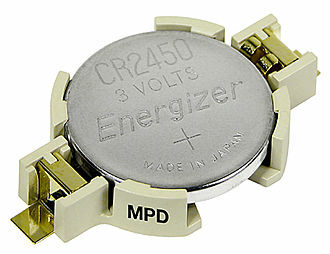 The top unit has three lithium-manganese dioxide cells internally, the bottom two are lithium-iron disulfide single cells physically and electrically compatible with 1.5 volt carbon-zinc or alkaline batteries. USAF Aeroshell "Flying Saucer" on public display in Missile Park at White Sands Missile Range. The oldest known depiction of a parachute, by an anonymous author (Italy, 1470s).